SQLRDD is a component of xHarbour Builder Enterprise that allows transparent access to the most important relational data bases of the market, accurately in the same way as if it makes with archives DBF. 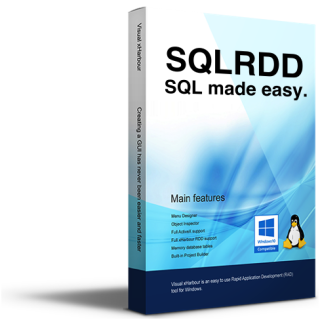 SQLRDD was created to access SQL database servers like Oracle, Microsoft SQL Server, IBM DB/2, Postgres, Sybase, MySQL, Firebird and others, from xHarbour xBase language just like you are used to use DBFCDX or any other regular xBase database driver. SQLRDD is not just SQL access. It's a complete toolset for quick migration of your complete application to any major SQL database, adding transactional control, database level constraints, etc., as well as direct SQL access. SQLRDD is more than a RDD. It is a complete suite to interact with SQL databases from within xHarbour compiler and most importantly, SQLRDD is Royal-free. It supports all the traditional commands of the Clipper/xHarbour, such as USE, APPEND FROM, SEEK, dbRLock(), dbUnlock(), dbCommit(), ZAP, REPLACE, etc. It supports commands of table creation and indices like dbCreate(), OrdCreate(), INDEX ON ..., etc. It supports all the functionalities of CDX indices like order bags and tags. It supports the index expressions with proper user functions. Simultaneous access to multiple databases without change in the xBase code. Royalty-free: this means that you do not need to pay a fee when distributing applications with SQLRDD. It does not need a module installed in the Server. Integrity of data supplied by the SQL database guaranteed. This means no more re-indexing! This an overview of the databases currently supported by SQLRDD. Please note that new databases can and will be added in the future. 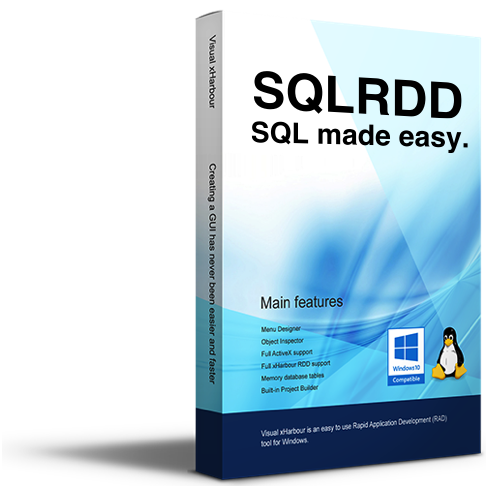 SQLRDD was created to access SQL database servers like Oracle, Microsoft SQL Server, IBM DB/2, Postgres, Sybase, MySQL, Firebird and others, from xHarbour xBase language just like you are used to use DBFCDX or any other regular xBase database driver.